The Fluke 62 Mini non-contact thermometer is the perfect introduction to infrared (IR) thermometers for the professional. Single point laser sighting. Dual displays shows current and MAX measurements simultaneously. Backlit display for poorly lit areas. Wide temperature range from -20 to 932 Deg F (-30 to 500 Deg C). Includes Storage Soft Case. 2 Year Warranty. Single point offset laser sighting. Best accuracy in its class: + 1% of reading. Holds temperature readings for 7 seconds. Wide temperature range from -30º to 500ºC (-20º to 932ºF). Backlit display for poorly lit areas. Holds temperature readings. Distance to Spot Ratio: 10:1 at 80% energy. Dual displays shows current and MAX measurements simultaneously. Handheld, non contact thermometer for quick and accurate temperature measurement. Display Hold: 7 seconds; Laser sighting: Single point, offset; Response time: 500m Sec. Temperature Range: -25 deg F to 999 deg F (-32 deg C to 535 deg C); Distance to Spot Ratio: 12:1; Accuracy: +/-2 deg C (+/-3 deg F) for targets between -18 deg C (0 deg F) to 23 deg C (73 deg F). 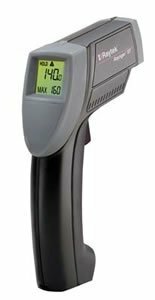 Handheld, non contact thermometer for quick and accurate temperature measurement. Display Hold: 7 seconds; Laser sighting: Single point, offset; Response time: 500m Sec. Includes: Batteries, plastic storage case or holster, operators guide and user manual. Temperature Range: -25 deg F to 1400 deg F (-32 deg C to 760 deg C); Distance to Spot Ratio: 50:1. High-resolution optics. High accuracy: 1 % and repeatability: 0.5 %.MAX temperature display. Laser targeting. Expanded measurement range: -32 to 545 ºC (-25 to 999 ºF). Distance to Spot Ratio: 12:1. The enhanced optics allow you to measure smaller objects further away. Laser guided sighting system for easy targeting with 1 % accuracy. 12-point data logging. Advanced optics to measure smaller targets at greater distances. Adjustable emissivity for more accurate temperature measurements. Expanded measurement range up to 600 ºC (1100 ºF). Laser guided sighting system for easy targeting with 1 % accuracy. 12-point data logging. Advanced optics to measure smaller targets at greater distances. Adjustable emissivity for more accurate temperature measurements. Expanded measurement range up to 760 ºC (1400 ºF). The 68IS (Intrinsically Safe) model with laser guided sighting system for easy targeting with 1 % accuracy, advanced optics to measure smaller targets at greater distances, adjustable emissivity for more accurate temperature measurements. Expanded measurement range up to 760 ºC (1400 ºF). Specifically designed for use by automotive technicians. Instantaneous 1% accuracy temperature measurement. Displays temparature in degrees Celcius and Faranheit. LCD Backlight, Max. Temp. Display, Display Hold. Temp. Range: 25 to 999 F 0. Features SmartSight Dual Laser Sighting System Two separate lasers create a single bright laser point. The ST20-XB features an extra bright single point laser sighting system. The extra bright laser sighting system concentrates all of the laser energy in a single point, showing the center point of the measurement area more visibly in all conditions, especially, outdoors. Temperature Range -25 to + 999 Deg F (-32 to + 535 Deg C); 1% accuracy; Includes protective case. 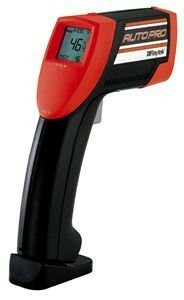 ST20XB Thermometer Gun Infrared -25 to 999 Degrees F. Easy to use: Just point, shoot and read. Accuracy: +/-1% F/C switchable. Laser: single point. Distance to spot ration: 12:1. Emissivity: Preset 0.95 emmisivity. LCD backlight, display hold, scan, max temp. Non-contact measurements keep safe distance between you and heat source. -25 to 1400 F (-32 to 760 degrees C). 1% accuracy F/C switch able 50:1 D:S. Single point class 2 laser sighting. Backlit display / Adj. emissivity Max, Min, Diff, Ave, Scan and hold functions. Data logging (12pts. ).